Following our last post, some of you asked about the availability of higher grade thermal paper. A variety of grades exist. There are four main aspects of thermal paper that affect its grade. 1. Sensitivity—how much energy it takes to image the paper. The higher the sensitivity the better the image. 2. Environmental Resistance—how resistant the paper is to things such as light, heat, and moisture. 3. Archivability Years—the number of years the paper will retain its image(s). 4. Caliper—the thickness of the paper measured typically measured in mils. POS Supply Solutions offers a wide range of OEM approved direct thermal POS products. 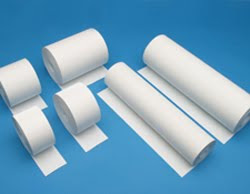 Whether your application calls for a standard POS grade, a high durability grade with 25-year archivability, or the use of multi-colored direct thermal, POS Supply Solutions has the thermal paper roll solution for you. In future posts we will explore each of these aspects in more detail. In the meantime, please contact us if you have further questions about thermal paper.